I realize it's been a while since I posted pictures of those silly little doggies of mine! So here are Jacque and Pippen from tonight. We are being pretty lazy and just laying around! It's good to be us!! have something in my hand! They are even more delicious than they look! If you can't really tell there are chocolate graham crackers under all that gooey chocolate chip and marshmallow topped with Hershey bar goodness!!! Mmmm....all this blogging about them....I think I'm going to go eat another!! Noodle-Head Sew Along Last Day!! Last day! I was so busy finishing my skirt that I didn't take any pictures along the way!! Here's a finished picture! It's a bit big in the waist, I recut my pattern 2 sizes smaller and cut out another skirt! Stay tuned!!! Oh my! Can't believe it's day 4 already! It's going by so fast! Today was the dreaded zipper day! I thought maybe I would try an invisible zipper, but decided just to follow along and use a normal zipper I already have. Then closed the zipper and pinned zipper down and basted in place. Turn the skirt right side out and sew around the zipper, about 1/4 inch from the seam, pivoting at the bottom sewing across the zipper then back up the other side! Pick out the basting stitches and you'll have a nice little zipper! Some random pictures of Jacque and Pippen now. They haven't been in a post in a while and, darn it, that's just not right!! Here we area again with another doggie who needs a home to introduce! This is Brownie! He's super cute and just a wee 16 lbs!! Looks like he could be a lot of fun!! Day 3!! I'm getting so excited! The skirt is coming along and I'm so excited to finish it so I can wear it! I folded, pressed and sewed the belt loop ties. The interfaced waistband pieces got sewn together and the seams pressed open. Lots of work for my iron! ....then the right sides of the waistband was pinned to the right side of the gathered skirt. Remember to match your seams and use lots of pins! I only had one rogue gather that I needed to pick out and correct. YEA!! It is looking like a skirt for sure now! Stay tuned.....tomorrow is the zipper!! 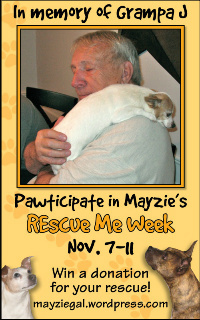 I've been so impressed seeing everyone's posts for Mayzie's Rescue Me week that I decided that I will post daily for the entire week! We missed Monday, but that's ok! This time I thought I'd search the Oregon Humane Society. I didn't find any Scotties (that's good! ), but there are so many other lovely and beautiful dogs that deserve a forever home! Today I'd like to introduce everyone to Dallas! Isn't he cute with that little bow on his head! His profile even includes a fun video of him! He's been there since August, so please! Lets try and find him a home! My first blogged sewing project!